You’d be hard pressed to find someone who believes that KITKAT’s can be made any better than they are. But then this happened. KITKAT Chocolatory has collaborated with Australian designer and iconic accessories creator—Georgia Perry. The collab features a range of six ‘Single Finger’ KITKAT special editions that have been created by the KITKAT Chocolatory head chocolatier—Connie Yuen—which includes flavours such as Cinnamon Doughnut, Hazelnut Pretzel Butterball, and Tropical Delight. 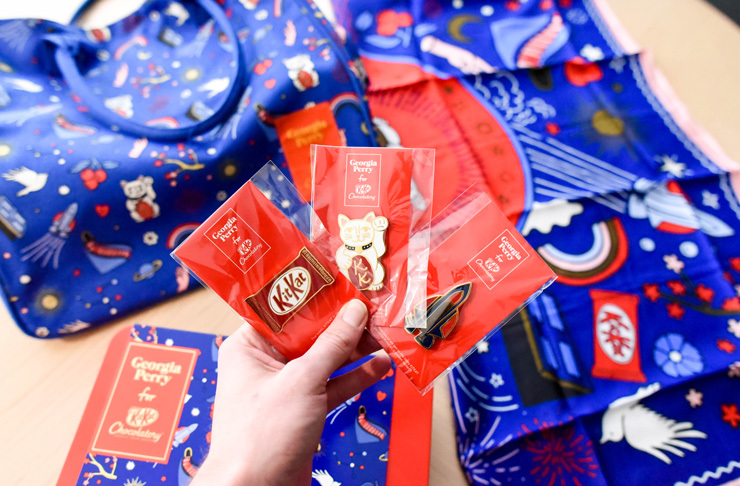 The Georgia Perry for KITKAT Chocolatory collection—6 exclusive Georgia Perry flavours, gift tin, scarf and KITKAT bar pin. These are all must-haves for even the most pedestrian of KITKAT fans. To celebrate the launch of the range, the first 50 fans to hit up the KITKAT Chocolatory at Melbourne Central on Saturday 19 August at 10am and purchase an item will get all three enamel pins as a gift. Visitors on launch day will also be able to get their hands on an exclusive one-day-only flavour of white chocolate, crisp batch baked wafers, crushed raspberries and caramelised meringue. Hold me now. Dark Cherry: dark chocolate base blended with cherry and topped with a cookie crumb twig, cranberries, raspberries and sprinkled with maccha powder. Cinnamon Doughnut: milk chocolate based blended with sweet cinnamon, half dipped in a cherry white chocolate and topped with sprinkles. Hazelnut Pretzel Butterballs: milk chocolate base infused with crushed hazelnuts, topped with a pretzel dipped in butter crocant. Lemon Meringue: white chocolate base blended with lemon and infused with strawberry, topped with a blueberry white chocolate graffiti and crushed meringue. Maccha Fruit Pretzel: white chocolate base blended with maccha, topped with pretzel, cranberry and apricot, finished with the iconic and edible KITKAT logo. The collection is available from Saturday August 19 – Saturday September 30. The Donut & Beer Festival: Winter Edition is on this weekend, it’s definitely one you don’t want to miss.